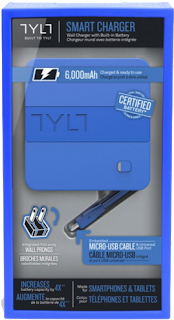 This dual purpose wall charger and portable battery charger by TYLT is known as the Energi 6K smart charger. This 2for1 deal is pretty impressive and we all know that TYLT is known for its quality products and reliability. This device is perfect for the day to day wall charger use you'll make as well as on the go juice while on the subway, train, or if you on a jog out. The versatility of this product makes it a must have in my books and with the holidays fast approaching, it might just be something to add to your wish list. I've been carrying the Energi 6K with me almost everywhere I've been in the past week and it's been very reliable. I get the opportunity to charge up two devices at the same time and this is convenient for me and family. I am one for the more compact design and although this square is about the same size as a coaster, I feel the design could have been optimized to make it a bit smaller, but knowing that TYLT has engineered this to be as small as possible, I'd recommend this to anyone looking for something that's easy to store away, pull out and use. The wall charger offers 6K of portable battery juice, a micro USB connected as well as a standard USB outlet, which provides you with the ability to charge up a second device easily. TYLT even indicates that you can still charge your device while it's plugged into the wall outlet. This might be a bit expensive for some, but well worth it for others at just $69.99.